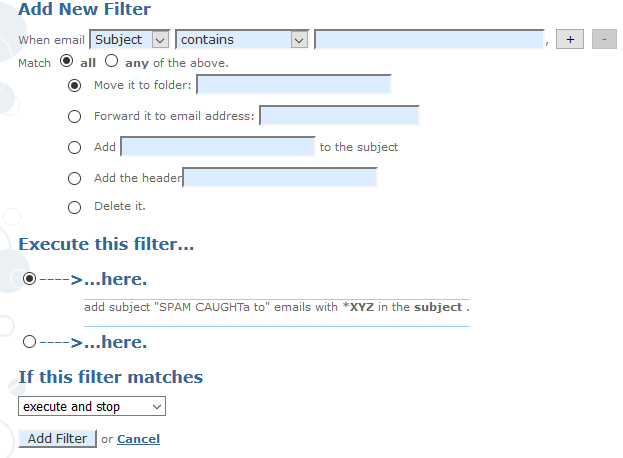 Message filters are special rules you can create which automatically perform actions on incoming email. This is a simple way to make incoming email easier to sort and categorize. For example, you could label all email messages from your boss as “Important”. 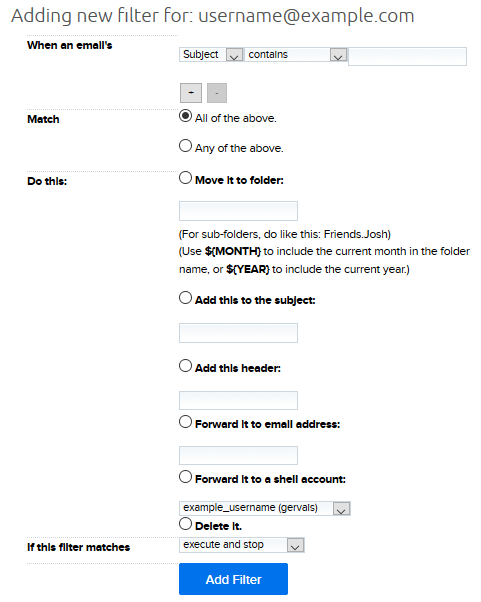 The filter could then add the word IMPORTANT to the subject of emails with boss@example.com in the from field. Filters can be created only for fully-hosted email addresses. Another option is to enable anti-spam filters in the panel. If you do so, the anti-spam filters are applied first, then your custom message filters are applied. 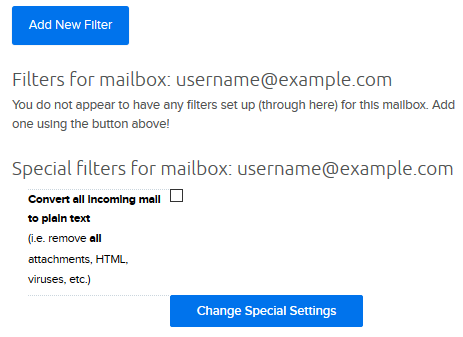 You can also add filters on your specific mail client such as Thunderbird, Outlook, or Gmail. This article describes how to add custom filters in your DreamHost panel. You can create a custom filter in your panel. A list of all your fully-hosted email addresses will be listed on your Message Filters page. To the right of an address, click the Edit button to open the filter page. If you have not added filters yet, click the Add New Filter button. When finished creating your rule, click the Add Filter button at the bottom. Log into your mailbox manager at https://mailboxes.dreamhost.com. Click the link under ‘Email Filters’. Enter your new filter settings and click Add Filter. How does the 'execute' option work? In these examples, email is being sent to admin@example.com while forwarding to forward@example.com. First, forward emails with Test in the subject to forward@example.com and then stop. Finally, add (execute and stop) to the subject of emails with Test in the subject and then stop. When the original email is sent to admin@example.com, it correctly forwards to forward@example.com without any text being added to the subject. The second rule is never triggered so the email never arrives at admin@example.com. First, add (execute and stop) to the subject of emails with Test in the subject and then stop. Finally, forward emails with Test in the subject to forward@example.com and then stop. When the original email is sent to admin@example.com, it does not arrive, but the subject text is added correctly. The second rule then forwards to forward@example.com in addition to adding the (execute and stop) text to the subject. This is the same as example #1, except the last rule is now 'execute and continue'. First, forward a copy emails with Test in the subject to forward@example.com and then continue. Finally, add (execute and continue) to the subject of emails with Test in the subject and then continue. The email arrives at the original address of admin@example.com with the (execute and continue) text added. It also arrives at the forward@example.com address, but the (execute and continue) text is not added to the subject. This is the same as example #2, except the last rule is now 'execute and continue'. First, add (execute and continue) to the subject of emails with Test in the subject and then continue. Finally, forward a copy emails with Test in the subject to forward@example.com and then continue. When the original email is sent to admin@example.com, it arrives with (execute and continue) added to the subject line. The email also arrives at forward@example.com with the subject text added.